INTRODUCTION.The prevalence of Americans with a BMI >40 is 4.7% but over 25% of Americans have a BMI >30. The risks and benefits of weight loss surgery are well documented. The population of patients between a BMI of 30-35 may also benefit significantly from these surgeries; many centers are proposing investigations along these lines. We hypothesize that a smaller subset of patients is likely to do extremely well from the standpoint of operative time, length of stay, complication rate, and comorbidity resolution, establishing a rationale for expanding surgery eligibility criteria. MATERIALS AND METHODS. Between 2002 and 2008, 672 LRYGB were performed. Patient demographics were entered into a longitudinal, prospective database. There were 120 males and 552 females with an average age of 42 years. 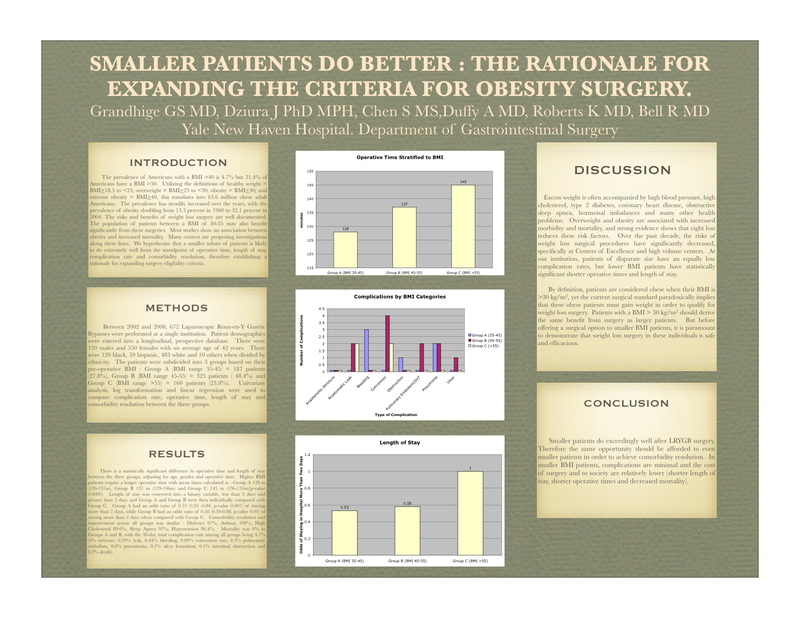 The patients were subdivided into 3 groups based on their preoperative BMI: Group A (BMI range 35-45) = 187 patients (27.8%), Group B (BMI range 45-55) = 325 patients (48.4%), and Group C (BMI range >55) = 160 patients(23.8%). Univariate analysis, log transformation and linear regression were used to compare complication rate, operative time, length of stay and comorbidity resolution between the three groups. RESULTS.There is a statistically significant difference in operative time and length of stay between the three groups, adjusting for age, gender and operative time. Higher BMI patients require a longer operative time with mean times calculated as: Group A 128m (120-137m), Group B 137m (129-146m) and Group C 145m (136-155m) (p-value 0.0005). Length of stay was converted into a binary variable, less than 2 days and greater than 2 days and compared to Group C. Group A had an odds ratio of 0.53 (0.33-0.84,p-value 0.007) of staying more than 2 days, while Group B had a ratio of 0.58 (0.39-0.88, p-value 0.01).Comorbidity resolution/improvement across the groups was similar: Diabetes 97%, Asthma 100 %, High Cholesterol 89.6%, Sleep Apnea 97%, Hypertension 96.4%. Mortality was 0% in Groups A and B, with the 30-day total complication rate among all groups being 4.7% (0% stricture, 0.74% leak, 0.44% bleeding, 0.89% conversion rate, 0.3% pulmonary embolism, 0.6% pneumonia, 0.1% ulcer formation, 0.1 % intestinal obstruction, 0.3% death).CONCLUSION. Smaller patients do exceedingly well after LRYGB; therefore the same opportunity should be afforded to even smaller patients in order to achieve comorbidity resolution. In smaller BMI patients, complications are minimal and the cost of surgery and to society are low (short length of stay, shorter operative time, decreased mortality).